sarvESvaran out of his causeless grace, reveals his true nature, forms, qualities and wealth as said in thiruvAimozhi 1.1.1 “mayarvaRa madhi nalam aruLinan” (blessed nammAzhwAr with faultless knowledge and devotion). Since that gyAnam (knowledge) is bhakthirUpApanna gyAnam (knowledge which culminated into devotion), AzhwAr with parabhakthi (first stage of pure devotion – full knowledge about bhagavAn) enjoyed bhagavAn’s qualities. He then acquired paragyAnam (next stage of pure devotion – clear visualization of bhagavAn as if seeing him physically) and as a result acquired paramabhakthi (final stage of pure devotion – the stage before ascending to paramapadham). As a result, as said in chAndhOgya upanishath 8.12.2 “param jyOthir upasampadhya” (reaches the supreme light, nArAyaNa), muNdaka upanishath 3.1.3 “paramam sAmyam upaithi” (jIvAthmA attains equality (in eight qualities) with supreme lord) and in periya thirumozhi 11.8.5 “thammaiyE okka aruL seyvar” (emperumAn will bless the AthmA to become like him), AzhwAr realised his true self and attained kainkaryam (service to lord) as said in thiruvAimozhi 3.3.1 “vazhuvilA adimai seyya vENdum” (desire to engage in service without any break) and thiruvAimozhi 10.10.11 “avAvaRRu vIdu peRRa” (nammAzhwAr, who attained liberation to be fulfilled of all his desires). periya mudhaliyAr (nAthamunigaL) obtained this confidential knowledge of dhrAvida upanishath (thiruvAimozhi) by nammAzhwAr’s grace. ALavandhAr obtains this confidential knowledge through the teachings of AchAryas, meditates upon them and being unable to control the love, due to the overflowing emotions and unable to bear the despicable state of samsAris (worldly people), thinking that they cannot be ignorant about this confidential knowledge, reveals this most confidential knowledge of all upanishaths and most difficult to learn principles, as sthOthram (praises) to be known by everyone. our words/speech have no other duty than praising emperumAn. Another explanation [Introduction focussing on prApyam (goal) and prApakam (means)]. [First, goal is explained.] purushArtham is explained as four in SrIvishNu purANam 1.18.22 “dharmArtha kAma mOkshAkyA: purushArthA udhAhruthA: | idham chathushtayam ” (These four – dharma (righteous actions), artha (wealth), kAma (sensual pleasures) and mOksha (liberation) are explained as goals) and in periya thirumadal 11 “mannum aRam poruL inbam vIdu” (the four aspects which remain firmly – dharma, artha, kAma and mOksha). Among these, though dharma is a goal as well as means [i.e., performing the righteous actions are means as well as goal], it involves difficulty. artha is an independent goal, yet, it is temporary, difficult to retain and is means to accomplish other goals. kAma too is an independent goal, yet fraught with being insignificant, temporary, disastrous [contrary to the nature of enlightened self], disgusting etc., and also highlighted as a hurdle for mOksha in mOksha SAsthram. Placing these aside, ALavandhAr looked at mOksham. In mOksham too, he first discarded kaivalya mOksham (eternally enjoying oneself) since that too is attained through difficult process which is to be performed for a very long period of time, and the result is insignificant when compared to enjoyment of bhagavAn and finally focussed on bhagavath prApthi (attaining bhagavAn after liberation) which does not have any of the aforementioned defects. Not only that, bhagavAn is explained to be perfectly blissful as said in SrIvishNu purANam 6.5.58 and 6.5.59 “nirasthAthiSayAhlAdha sukhabhAvaikalakshaNA” (having the greatest bliss as his identity) and would also bestow the same bliss on his devotees as said in thaiththirIya upanishath Anandhavalli 7 “Esha hyEvAnandhayAthi” (He only gives pleasure to jIvAthmA), muNdaka upanishath “paramam sAmyamupaithi” (attain the supreme similarity) and periya thirumozhi 11.3.5 “thammaiyE okka aruL seyvar” (emperumAn will bless those who worship him to become similar to him). Since he is easily attained and is the apt goal as said in SrI bhagavath gIthA 8.14 “thasyAham sulabha:” (I am easy to attain), bhagavath prApthi (attaining of bhagavAn) is considered as the best goal. The different stages/aspects of attaining bhagavAn are explained with pramANams (references from the sacred texts) to conclude the best among those. SvEthASvathara upanishath 1.9 “gyAggyau dhvAvajAvISanISau” – paramAthmA and jIvAthmA are omniscient and ignorant respectively; they are lord and non-lord (servant) respectively. thaiththirIya upanishath “sOSnuthE sarvAn kAmAn saha brahmaNA vipaSchithA” (jIvAthmA enjoys all the auspicious qualities of bhagavAn, along with him) and in periya thiruvanthAdhi 78 “OvAdha UNAga uN” (enjoy as eternal bliss). SrI rAmAyaNam ayOdhyA kANdam 31.25 lakshmaNa says “aham sarvam karishyAmi” (I will carry out all kainkaryams). Based on these, he concludes that as a chaste wife would lovingly serve her husband (husband’s bodily needs), a jIvAthmA would lovingly perform kainkaryam to bhagavAn. it is said in katOpanishath 1.3.9 “sOdhvana: pAramApnOthi thadhvishNO: paramam padham” (One who has true knowledge as driver and mind as the restraint, he reaches vishNu’s divine abode which is on the other shore of material realm) that spiritual realm is goal due to the fact that one’s kainkaryam develops there. it is said in jithanthE sthOthram 1.4 “nistharanthi manIshiNa:” (they cross over the ocean of material realm) that the removal of hurdles (samsAram) is the goal, since it is a hurdle for one’s kainkaryam. If any/all of these are not leading to kainkaryam, they are not to be treated as goals as said in SrI rAmAyaNam sundhara kANdam 26.5 sIthA says “na hi mE jIvithEnArtha:” (There is no use of my life, body, ornaments etc., when I am in separation from SrI rAma) and as said in thiruvAimozhi 4.8.1 “maNi mAmai kuRaivilam” (there is no use of my beautiful complexion), thiruvAimozhi 4.8.9 “udambinAl kuRaivilam” (there is no use of my body), thiruvAimozhi 4.8.10 “uyirinAl kuRaivilam” (there is no use of my self). A chaste wife would be focussed on serving the beautiful body of her husband more than his true self, his qualities and as such there is no deficiency in her chastity due to that [Since she is serving her husband with the right attitude, one cannot say wife is attached only to husband’s body]. Similarly, a devotee of bhagavAn would be focussed on thadhIya SEshathvam (being servitor of the devotees of bhagavAn) which is explained as a goal in itself [since bhagavAn’s devotees are considered as bhagavAn’s different bodies/forms and bhagavAn pervades them with great affection]. Thus, ALavandhAr determines the top-most goal which is the essence of all SAsthram. For this goal, there are two [main] means – bhakthi [yOga] (path of devotion) and prapaththi (surrender). bhatkthi yOga should be supported with fire sacrifices; it should be supported with karma yOga and gyAna yOga – so it can only be performed by qualified persons [thraivarNikas – men belonging to brAhmaNa, kshathriya and vaiSya varNams only]; the result is attained after a very long period of time only; there is scope for slipping from the process. Discarding bhakthi yOga due to these defects, ALavandhAr determines prapaththi, which does not have any of these defects, to be the best means due to its being established in Sruthi (vEdham) and smruthi (manu smruthi etc), easy to perform, and which is adhyavasAyAthmaka gyAna viSEsham (a special type of knowledge which is in the form of complete faith) based on the following pramANams. SvEthASvathara upanishath6.18 “mumukshurvai SaraNamaham prapadhyE” (I, who desire to be liberated, surrender unto parama purusha (bhagavAn) who first created brahmA, who instructed vEdham to the created brahmA …). thaiththirIya upanishath nArAyaNavalli 50 “thasmAn nyAsamEshAm thapasAm athirikthamAhu:” (Thus, this nyAsa (SaraNAgathi) is said as the top-most penance). yajur kANdam 6.5 “thasmAdhapi vadhyam prapannam na prathiprayachchanthi” (If one has surrendered, even if he is qualified to be killed, he should not be identified to others). SrI rAmAyaNam yudhdha kANdam 18.33 “sakrudhEva prapannAya” (even if one surrenders once, I will never abandon him). SrI bhAgavatham 11.5.41 “sarvAthmanA yaS SaraNam SaraNyam nArAyaNam lOka gurum prapanna:” (One who is fully surrendered to SrIman nArAyaNan, he is neither indebted to nor servitor of dhEvas, rishis, creatures, relatives and pithrus (ancestors)). SrI bhagavath gIthA 7.14 “mAmEvayE prapadhyanthE mAyAm EthAm tharanthi thE” (one who is surrendered to me, will cross over the ocean of nescience). Can this praise be not done in the mind [should it have to be expressed through words]? Since it will be a great favour to those who are desiring to learn this prabandham, to have it expressed through words is apt. Worshipping AchArya out of gratitude is well established from various pramANams. vishNu thathvam “manthrE thadhdhEvathAyAncha thathA manthra pradhE gurau” (One should be devoted to the manthram, the dhEvathA who is explained in that manthram and the AchArya who instructed the manthram). Further, when some one gives a precious gem, it is obvious to be grateful towards such person who gave the precious gem. Do we need any special proof from scriptures for that? It is also seen in practice of elders to praise the AchArya to have one’s knowledge flourish. vaiSampAyana rishi – mahAbhAratham Adhi parvam 1.27 “yasya prasAdhAth vakshyAmi nArAyaNa kathAm imAm” (I worship the unlimited, radiant vyAsa bhagavAn by whose grace I am reciting this history of nArAyaNa). nAthamunigaL, by the grace of nammAzhwAr, acquired the great knowledge that was acquired by AzhwAr due to AzhwAr’s great devotion towards bhagavAn, instead of curtailing that knowledge with him, desire to bestow the favour of sharing it with the future generation, and thus became dharSana sthApaka (presiding AchArya) of our sampradhAyam. 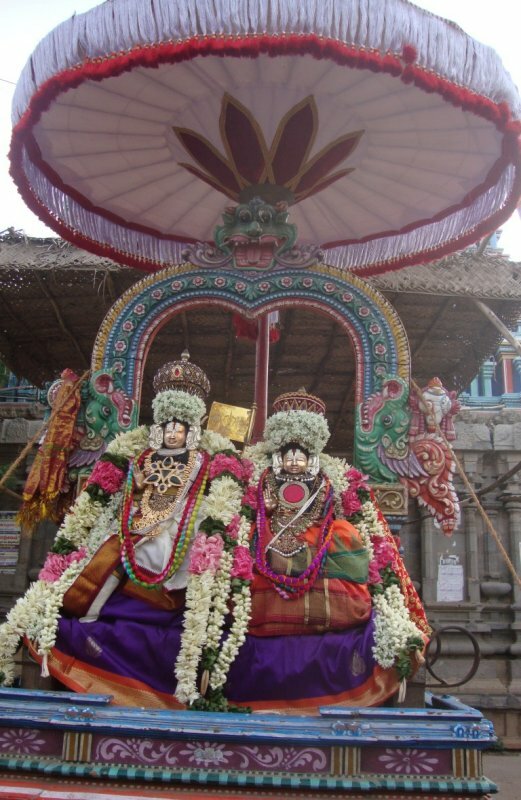 maNakkAL nambi tells ALavandhAr “all these principles are explained by nAthamunigaL; your connection with his divine feet is the means for your ultimate goal”. Only due to this consideration, bhattar too said in SrIvishNu sahasranAma bhAshyam “prathamamapi gurum nAthamIdE” (I worship nAthamunigaL as well who is the first AchArya). As praNavam which is the origin of vEdham is recited at the beginning and the end of vEdham, here, AchArya is praised in the beginning and end and bhagavAn is praised in between. First, ALavandhAr worships nAthamunigaL in three SlOkams. In the next article, we shall see the first SlOkam. This entry was posted in Other, sthOthra rathnam on December 12, 2016 by Sarathy Thothathri.